PCN Flight West: DL Capt. James S. Tiffany Sr.
DL Capt. James S. Tiffany Sr.
James Sherwood Tiffany, age 94, passed away June 18, 2012. Born June 4, 1918 in El Paso, Texas. Just prior to WWII, Jim was drafted into the Army and served in the 7th Cavalry horse unit before being transferred to the Army Air Corps where he became a B-24 flight instructor. 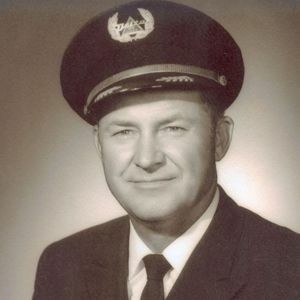 In 1945, Jim began his career with Delta Airlines as a co-pilot, and soon after, advanced to the rank of captain. He always said that during his 33 years as a pilot, there was never a boring moment. He retired from Delta in 1978 and spent his retirement years with his wife, Bettye, extensively traveling all over the world. He is survived by his wife of 28 years, Bettye Bobbitt Tiffany; two daughters and a son from a previous marriage, Camille Magness & husband, James, of San Antonio, TX; Barbara Bledsoe of Honolulu, HI; James Tiffany, Jr. & wife, Ani, of Sante Fe, NM; five grandchildren, five great-grandchildren, many nephews and nieces. He is also survived by extended family, Todd Hefley & wife, Gae, Edie Lee and Margaret Reeves, plus six grandchildren and seven great-grandchildren. Jim loved life, cherished his family and friends and was always known as a true gentleman. The family would like to thank the staff of Avalon Homes for their loving care of Jim. Services will be held at 3:00 p.m on Friday, June 22, 2012 at Restland Wildwood Chapel. Published in Dallas Morning News on June 20, 2012.